Semilandmarks on midsagittal Corpus callosum outlines. 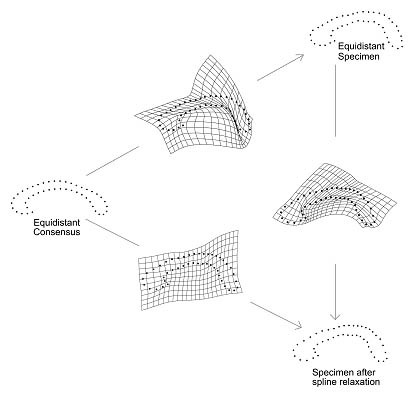 Deformation grids between the consensus form (left side) and a form with equidistant points (upper right) compared with the same form captured by semilandmarks (lower right). Note that the strong local shape effects suggested by the left upper thin plate spline are an artifact of the equidistancy; the lower left spline, reflecting the real shape difference, is much smoother. Sliding landmarks make it possible to include outline information in the geometric morphometric analysis. Semilandmarks lie on homologous curves yet their exact position along these (usually smooth) curves is unclear. As a part of the superimposition procedure, the semilandmarks are allowed to slide along their curves in order to minimize the thin plane spline's bending energy from the actual landmark configuration to the sample average configuration. This algorithm provides smooth and interpretable deformation grids among the forms.